The best children’s books are original, humorous, and full of characters that connect with readers to make their worlds seem more interesting and alive. In that light, Wyatt Burp Rides Again (The Adventures of Jo Schmo) definitely qualifies as a “best” children’s book. 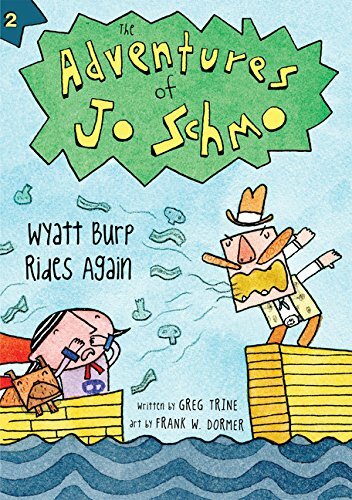 In Wyatt Burp Rides Again, fourth-grade superhero Jo Schmo is bored stiff because crime just isn’t what it used to be. There’s no crime wave (or even a crime ripple), and no bad guys to practice her knuckle sandwich and special Siberian Ear Tweak on. So Jo builds a nifty time machine (which looks suspiciously like an outhouse) and travels back to 1849 in search of a dastardly villain named Wyatt Burp—the outlaw who once burped so loud, he blew the doors off the First National Bank of San Francisco . . . then robbed it, of course. Once in 1849, Jo and her faithful dog Raymond track Wyatt by following the thunderous sound of his burps. Each burp makes Raymond drool “like it’s going out of style,” because the smell of what Wyatt had for breakfast—bacon and eggs and a piece of sausage—always lingers in the air. Wyatt and his gang are afraid of Jo, not because she’s a superhero, but because she is wearing a cape—and they think she is a vampire. After all, what other creature (besides a vampire) wears a cape in 1849? Wyatt Burp Rides Again is a hilarious book with an adorable cast of quirky characters. There is clever Jo Schmo, her little dog Raymond, her arch enemies, Gertrude McSlime and Betty Sludgefoot (who plot all sorts of dastardly deeds to get rid of Jo), and finally, Wyatt Burp and his gang, including Festus--the Number Two Man who happens to smell like number two. There are also tons of secret club-like organizations that children are sure to love: the Society of Mean Girls (SMG), the National Society of Supervillains and Evil-Deed Doers (NSSEDD), and the National Society for the Advancement of Burping (NSAB), which Gertrude and Betty are proud to belong to. Dozens of black-and-white pencil sketches drawn by artist Frank W. Dormer show onion-and-mushroom laced burps, lopsided time machines, and google-eyed enemies. Wyatt Burp Rides Again should do well as “free” or independent reading material, as alternative fiction in a history classroom, as inspiration in a creative writing class, and in a theater setting as a hilarious elementary school play. Whatever the setting or occasion, it is certain that the plot, characters, and humor of this book will be remembered long after the last page. Rita Lorraine Hubbard is the author of African Americans of Chattanooga: A History of Unsung Heroes. She is an accomplished former school educator and currently writes for Rosen Publications, providing supplemental reading for K–12 schools across the U.S.